Nissan’s recently revamped Leaf EV may be decidedly bland, but if specs that leaked over the weekend are accurate, the car’s forthcoming long-range trim could make up for its lack of excitement. Nissan said it was planning a 200+ mile range Leaf for 2019, and based on a set of slides obtained by the website PushEVs, the car will be able to travel about 225 miles on a single charge. That puts it right around the range of a Chevy Bolt EV and a base Model 3. PushEVs didn’t say how the slides were obtained, but the specs jibe with what was expected from Nissan. The slides show the new version of the vehicle will feature a 60 kWh batter pack, a 160 kW electric motor and a 11-22 kW onboard charger. The changes will enable the Leaf to utilize a DC fast-charging rate of 100 kW, a speed that’s necessary for Nissan to compete with Tesla’s Supercharger network. A Nissan spokesperson told Jalopnik they “can’t confirm the speculative details that are circulating,” as official specs for the 2019 Leaf haven’t been released. “We can confirm though that the 2019 Nissan LEAF will have a larger battery and a range of 200+ miles,” the spokesperson said. Tesla has the advantage of having the key charging infrastructure in place, but the price-point for the Leaf makes it an attractive purchase for those looking for a reputable and easily-serviceable EV. Nissan’s also introducing an updated ProPILOT semi-autonomous suite for the new Leaf. While it doesn’t have the full capabilities of Tesla’s Autopilot—it has adaptive cruise control and lane-keeping tech, but can’t handle lane change—Nissan’s simpler self-driving technology package can be added as an option at a cheaper premium than Autopilot. The Leaf lacks the buzz surrounding Tesla’s Model 3, but Nissan brings to the table the ability to roll out and sell the new EV in all 50 states this time next year. Tesla reported on Wednesday that it doesn’t expect to produce more than 5,000 Model 3s per week until the summertime. Even then, it still has 450,000 reservations to plow through. 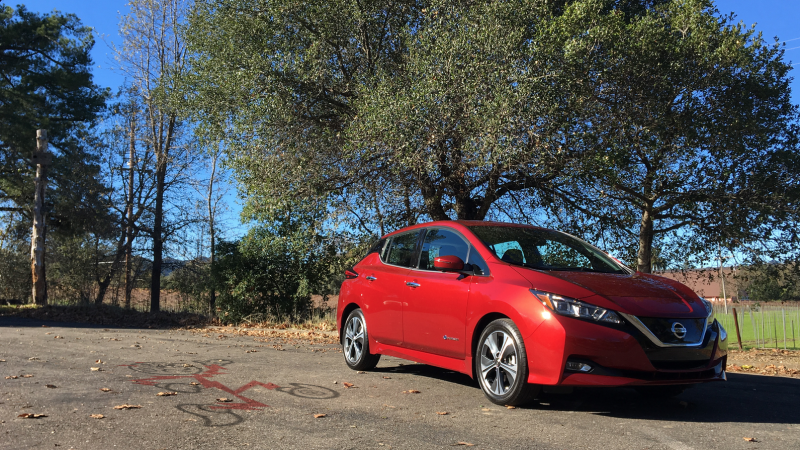 Will the Leaf eat into Tesla’s deposit count? Probably not. But with a 220-mile range, it’s better-positioned to compete with the Bolt—which cleared 20,000 sales in 2017—than it was with the straight-laced version we tested out last month. But newcomers who’re interested in EVs but unwilling to wait until 2019, or even 2020, for a Model 3, could be dissuaded by a simple fact: the Leaf’s going to be on sale and available much sooner.